We’re working hard on developing applications for the upcoming BlackBerry® 10. The first result of this approach is our new game for BlackBerry® 10 Devices: Tiles. The aim of the game is to clear a field filled with tiles in 6 different colors in as little moves as possible, you can remove tile by touching them. Connected tiles with the same color will be removed in a single move. 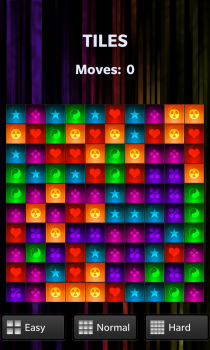 The cleared field connects each same colored tile, so plan your moves carefully! There are 3 different difficulty levels to choose from. Start at the bottom and work your way up to maximize the fun! Tiles is available for $0.99 at BlackBerry App World™. Tiles is compatible with all BlackBerry® 10 devices.